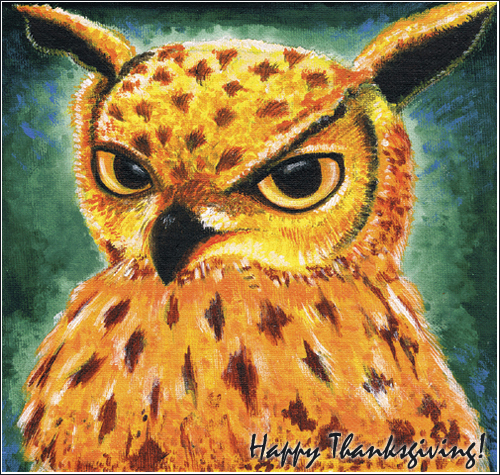 My Owl Barn: Happy Thanksgiving! Happy Thanksgiving friends! I hope you have a great holiday weekend filled with lots of love, laughter and food. Here are some links for you to check out for last minute holiday inspiration, printables and easy recipes. - Free 2015 calendar to download from here. A great gift! - Printable place card holders, bingo, tags and more from here. - Advent calendars to make over the weekend. - Deck the halls with these. - Owl pumpkin pie, a perfect Thanksgiving dessert. P.S. : If you like, you can join My Owl Barn on Facebook for more owl-some posts. Thanks! Delightful little owl card. Thank you.